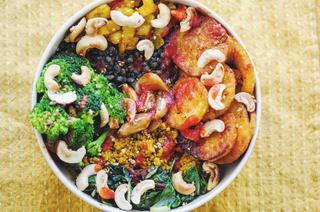 Hearty, healthy, comforting, and delicious Warming Winter Buddha Bowl filled with turmeric sprouted quinoa, french green lentils, paprika & garlic roasted sweet potatoes, broccoli, bell peppers, wilted greens, cashews, sesame seeds, and a generous drizzle of sriracha! Gluten-free and vegan. Turmeric Sprouted Quinoa: Combine all ingredients, bring to a boil, cover, reduce to a simmer and let cook for 15 minutes. Let sit for 5 minutes before uncovering & serving.Petite French Green Lentils: Combine lentils, water & oil. Bring to a boil, reduce heat & simmer for 30 minutes or until desired tenderness is achieved, adding more water if needed. Salt & pepper to taste before serving.Paprika & Garlic Roasted White Fleshed Sweet Potatoes: Peel sweet potatoes, slice into rounds, rinse well. In a large pot, add potatoes and cover with cold water. Boil 8 minutes, or until you can pierce with a fork. Preheat oven to 375°F. On a cookie sheet, place your sweet potato rounds & cloves of garlic (paper intact). Using a spoon, smash each potato round slightly. Sprinkle with pepper, paprika and salt. Drizzle with oil, toss all to coat. Bake for 15 minutes, flip, then bake for another 15 minutes. Turn heat to 400°F, flip, and bake for 25 minutes, or until desired crispness is achieved. To serve the roasted garlic, simply squeeze the clove out of the paper!1 yellow bell pepper: chopped & sauteed in a dash of oil & maple syrup until beginning to caramelize.Wilted greens: a handful of fresh greens thrown in a slightly oiled skillet over med. heat until wilted.1/2 cup cashews, 1 tbs sesame seeds: toasted in a pan over medium heat in 1 tbs oil, and a pinch of salt & cayenne for about 5 minutes or until turning golden brown.Arrange & combine all of the above in a large bowl (or 2 regular bowls).Drizzle with sriracha & sesame oil...then dig in & enjoy its hearty nourishment!